This original book is a comprehensive, richly documented and critical examination of laws applicable to Anglican cathedrals in England, some of the most iconic monuments in the national heritage and centres of spiritual and cultural capital. Law is the missing link in the emerging field of cathedral studies. The book fills this gap. 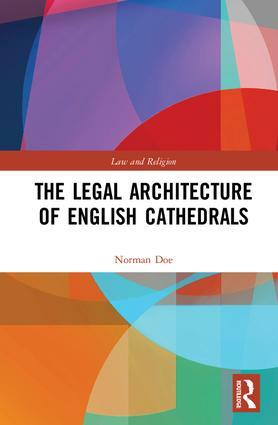 It explores historical antecedents of modern cathedral law, traces aspects of them that still endure, and explains the law with particular reference to the recommendations of the Archbishops’ Commission on Cathedrals 1994 which led to the most radical changes in the legal history of these churches since the Reformation, culminating in the Cathedrals Measure 1999 and associated later legislation. The book compares the domestic constitutions and statutes of all the cathedrals of the Church of England today – old foundations, new foundations and parish church cathedrals - as well as policies and guidelines applicable to or adopted by them. Whilst national law acts as a fundamental unifying force, there is considerable diversity as between these in terms of the breadth and depth of their coverage of topics. In the socio-legal tradition, the book also explores through interviews with clergy and others, at half of the cathedrals, how laws are experienced in practice. These reveal that whilst much of the law is perceived as working well, there are equally key areas of concern. To this end, the book proposes areas for further research and debate with a view to possible reform. Taking an architectural feature of cathedrals as the starting point for each chapter, from cathedral governance through mission, ministry, music and education to cathedral property, what emerges is that law and architecture have a symbiotic relationship so that a cathedral is itself a form of juristecture. Norman Doe DCL (Lambeth), LLD (Cambridge) Professor of Law, Cardiff University. Director of the Centre for Law and Religion, Cardiff School of Law and Politics. Sometime Visiting Research Scholar, Corpus Christi College, Oxford Chancellor of the Diocese of Bangor.